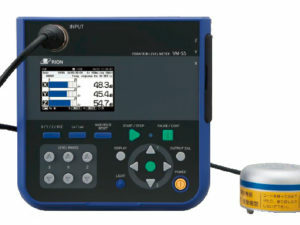 The VM-54 Vibration meter Rion is equipped to evaluate human response from whole-body and hand-arm vibration and can be used as measurement system for evaluating comfort in passenger vessels and merchant ships. It can also be used as single axis to triaxial vibration meter for acceleration level measurements or frequency analysis. Vibrations arising in vehicles are transmitted to the human body via the feet, posterior, and via the back when leaning against a backrest. 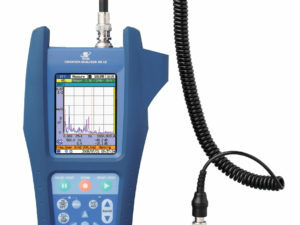 Methods for evaluating the effect of such vibrations are specified in the ISO 2631 series, which are concerned with vibration perception, comfort levels, and health damage. The standards aim at quantifying periodic as well as irregular and transient whole-body vibrations. 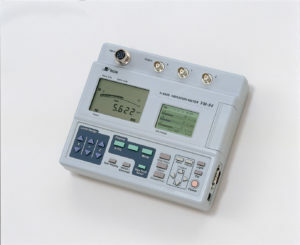 Special frequency weighting characteristics are given for various vibration transmission routes and for the three axes.The whole-body vibration measurement system consists of the Seat Measurement Accelerometer PV-62 (tri-axial), 3-Axis Vibration Meter VM-54, and Whole Body Vibration Card VX-54WB1. The system allows measurement and evaluation compliant to the relevant standards. Vibrations arising in hand-held tools are transmitted to the hands, arms and shoulders of the operator. Methods for evaluating such vibrations are covered by ISO 5349-1and ISO 5349-2. These standards not only specify frequency weighting characteristics and evaluation factors, they also contain detailed information about how to mount accelerometers. The hand-arm vibration measurement system consists of the Accelerometer PV-97C (tri-axial), 3-Axis Vibration Meter VM-54, and Hand-Arm Vibration Card VX-54WH. The system allows measurement and evaluation compliant to the relevant standards. The VX-54FT program adds FFT analysis capability to the VM-54 meter. Saved analysis results can be recalled on the display. The VX-54FT functions as a memory card and allows storing FFT analysis result data in CSV format. The supplied Excel macro makes it easy to generate a graph display from the stored data.